finds a path between vertex s and vertex t in the graph g.
finds a path of length at most k between vertex s and vertex t in the graph g.
finds a path of length exactly k.
finds a path of length between kmin and kmax. finds at most n paths. FindPath returns a list of paths from s to t. Each path is given as a list of vertices. FindPath[g,s,t,kspec,All] finds all the paths. 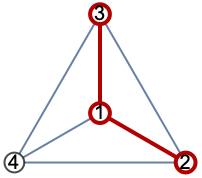 For weighted graphs, FindPath[g,s,t,k] gives all paths with total weights at most k.
FindPath works with undirected graphs, directed graphs, weighted graphs, multigraphs, and mixed graphs.